I can’t believe how far we’ve come, and that we are going home soon! We are continuing our soak and seal and then wet wraps where needed at the Ronald McDonald House every morning and evening. At this point, we are soaking and sealing the body and face with Vanicream. In the morning, we dry wrap hands and feet with Protopic. In the evening, we wet wrap hands and feet with the topical steroid. The plan for today is to challenge baked cheese in the form of pizza. If she passes that, we’ll challenge gently cooked milk in the form of a cheese stick. If she passes that, we’ll challenge fresh milk in the morning and then spend our last afternoon with a local friend at the zoo. I don’t expect to get very far in these milk challenges. The last time she sneaked a cheese stick, she reacted terribly. Her whole body turned red, hot and itchy. She was miserable for days. She hasn’t tried to sneak cheese since. We started our pizza challenge as soon as we got to the hospital. When she had no reaction, I cried at the thought that we could order pizza as a family. I know it’s not health food, but it’s convenient food. For the past five years, I have felt guilty every time we’ve ordered pizza and left her out. This is so liberating! After the food challenge, the nurses asked Bella to teach a little boy in the program how to do a nose wash. I’m telling you, these nurses know what they are doing. Sure enough, she walked straight in the bathroom and did a nose wash by herself. Her little friend did it too. We were all so proud. After all the excitement, the nurse said she needed to call Beth Ann. Our main nurse, Beth Ann, was off today. It turns out that she left a note for the other nurses to call her at home if Bella did a proper nose wash by herself. That is the kind of care you get at this place! In the afternoon, we had the cheese stick challenge and to my surprise she had no reaction! Consider my mind blown! National Jewish keeps a little bar stocked with fruit, bagels and juices for the parents. I have eaten a bagel every morning for breakfast. Bella has never had a bagel, and she has been coveting mine. A few challenges ago, I realized she could now have one. She’s not allowed to eat other food while she is doing a food challenge, so this morning I stuck one in my purse for her to have when we left the hospital. She was so excited; she pulled it out of my purse in the parking lot. Wouldn’t you know she dropped it? What in the world? Was she scratching her face while she was crying? She was sitting behind me in the car, so I couldn’t see her. Or was this some kind of delayed reaction? The doctors told me that true delayed reactions were very, very rare. She seemed absolutely fine other than the splotches on her face. I quickly took her into the store to pick out a bagel. After all that drama, she chose a donut instead! We headed back to the hospital. 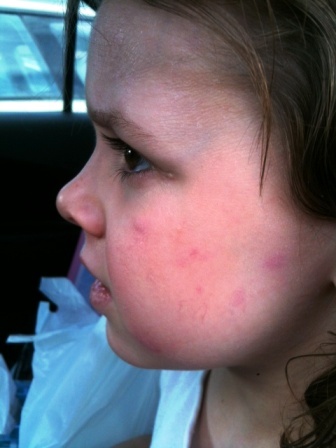 The doctors weren’t sure if she had an unusual reaction or if she had scratched her face either. One thing was sure. They were not comfortable going forward with the fresh milk challenge tomorrow. We stayed for observation for a couple of hours. The splotches went away, and we went back to The Ronald McDonald House absolutely exhausted. You are an excellent mother. Your story is very moving, and I am lucky to have read it. Thank you for being brave and sharing it! Thank you Jen! That is very, very sweet! I’ve been reading your posts about Bella, and I have to say I cried reading them, also as I can relate and feel her pain to an extent. She’s really strong for handling all of this at such a young age. And you remind me of my mom; even though I’m 19, she takes such special care of me, and is constantly examining my eczema and trying to make life easier. I only recently realized how hard it is on the parents to have a child that suffers from eczema. I’m trying to cure my eczema too, and hope your daughter will heal soon. Hi Massuma, Thank you so much for your sweet note! I found it very touching. I’m so sorry you have suffered with eczema. It sounds like you turned into a wonderful young lady in spite of it. I am sure your mom is proud of you. Thank you for sharing your story! It is really inspiring and it gives me hope. My son is 2 and we have been dealing with food allergies since he was 5 months old. We were very lucky to have found a great derm here in NYC who gave us bleach bath and wet wrap treatments. They make such a big difference. You are very brave with the food challenges. We are coming to that point now with a new allergist. My son also has asthma so thank you for the info about the nasal washes. 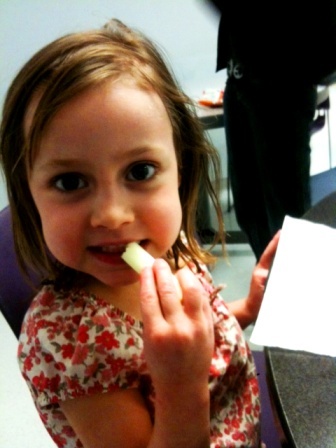 Hi Lucy, Welcome to Real Food, Allergy Free! You are very blessed to have a doctor who was comfortable teaching you about wet wraps. Best of luck with your food challenges. They were definitely worth it for us. How was day 10? My son has terrible ezcema. Did you guys ever figure out the triggers? Hi Canem, Day 10 was short and sweet. She passed the cheese stick challenge again. We were pooped and took off after that. At home we have found that she is sensitive to uncooked dairy. She can handle cheese in small amounts but yogurt, ice cream, etc causes that weird reaction. Have you looked at going to National Jewish? I highly recommend it. It was life changing for us. I’m considering it…but he’s only 4 months. So far I’ve removed everything detergent related item from the apt and have changed my diet completely (I’m bf’ing). My family thinks since I’m crying through the day from his uncomfortableness, itching, bleeding, weepy raw open wounded face, I’m passing on my stress to him. I have to think its more than that. Do you hydrate his face with water before using moisturizer/meds? If you put creams on top of the dry face you are creating a barrier, blocking moisture from the outside. You need to get moisture in the skin and then seal it with a moisturizer. If you keep warm clean wet clothes on his face for 15 minutes and then immediately apply whatever it is you use (moisturizer/steroid), you will see a big difference. Try to do this up to 3 times per day. Let me know how it works. I’m sorry Canem! I just realized I haven’t answered you! How is your baby? I had all the concerns you had about steroids and lotions, but this is the analogy NJH gave me when we were there. They said it’s like trying to put a house fire out with a garden hose. You can’t do it. You have to do what you have to do to get the skin barrier healed. Once the skin barrier is healed it is easily maintained with little to no steroids. In the long term you use less steroids. I have found this to be true. NJH doesn’t recommend vaseline type products because it doesn’t “breath” and kid’s sweat gets stuck underneath the ointment and produces bacteria. However, in the dryness of winter, when she is not sweating, I am using Vaseline. At bedtime, she soaks in bath or shower for 15-20 minutes. Without drying her off, I cover her in a thick coat of Vaseline. Many nights she needs steroids on her hands and feet. No matter what, her hands and feet get wet wrapped or they itch during the night. In the morning she puts protopic on her hands and feet when she gets dressed. If I did the soak and seal 2-3 times per day, we would probably need to use steroids less often on the hands and feet, but there are only so many hours in the day! I would keep your little ones hands covered with gloves or socks as much as possible. It will prevent whatever you use from going in the mouth, prevent scratching and help keep moisture in the hands. As for the natural moisturizer, palm shortening is the only thing that really worked for us. Oh and only a mild steroid should be used on the face. Did I write that there was a baby (6 month old I think) in the program when I was at NJH? I was a little jealous that they found help so early! I found your blog from the Facebook group Eczema Parents. I have been reading with tears in my eyes also, because I have been battling eczema with both of my boys. The oldest is 5, and I also have a nearly 9-month old. As a parent, you can’t but feel just helpless. Nothing would hurt me more than remarks from strangers in the store about how miserable my oldest looked when he was a baby. It makes me feel like the worst mother ever! How did you get into the program at the hospital? Is it something that your insurance may cover, or is it out of pocket? Thank you for sharing your experience! Hi Denise, I’m so glad to help you find NJH! My insurance covered the whole thing. We have a high deductible plan and then it’s 100% coverage after that. One of my other daughters spent several days in critical care for pneumonia/asthma earlier in the year and that caused us to meet our deductible. Anyway, if you call the hospital the people that answer the phone are incredible. They will check with your insurance and find out what they will cover. They told me my insurance would not cover the dietitian and I could chose not to see her. There have been several within that Facebook group whose insurance will/did not cover the stay. They put together a fundraiser and raised enough. I stayed at the Ronald McDonald House which was beyond amazing. Bella loved it there. Volunteers will fix you dinner every night. The hospital will feed your daughter breakfast and lunch and one meal for you. There is a free breakfast bar with fruit and bagels open all day, so I ate that and ordered lunch. Someone heard our story and bought our plane tickets with their frequent flier miles from their work travel. I think the most expensive thing was a rental car and we got a great deal through Costco. So, give them a call and get things rolling. You’ll be so glad you did. Please keep in touch and let me know how it works out! I am up so late reading your blog. I was so excited and surprised to see that you have been and are going through the same exact thing we are. My son is now 9 and is worse than he’s ever been. When he was born, I knew then that he wasn’t like my two oldest children. He developed cradle cap really bad and from then on, I started to notice his skin getting bad. I knew what to look for when it came to food allergies, since my older son was allergic to dairy and developed a severe case of eczema on his feet and hands. My youngest, Aidan, wasn’t that lucky. Through the years after many visits to pediatricians, allergists and dermatologists, we found out he was allergic to wheat, dairy, eggs, soy, corn, peanuts, tree nuts, some fish shell fish and the newest sunflower seeds. I cried while reading through your journey because I can relate. Oh how can I relate. He has been admitted to the hospital 5 times since his birth. Mostly for staph infections, the last two times were MRSA. Because he is allergic to so much of the foods, it’s a challenge to medicate him since so many medications have some kind of allergen filler in them. I would really like to see if he can go to the same hospital that your daughter is at. I have heard a lot of great things about that hospital. I pray that your daughter gets better with time and I wish you all the best. We’ve been home since May and I can’t tell you what a difference NJH has made for us. We live a normal life now! The only food allergy we are dealing with is to nuts. She has had no trouble sleeping. She has been able to spend the night out, go to the beach and do lots of things that weren’t possible before. I highly, highly, highly recommend NJH. Please join the Facebook Group Eczema Parents: https://www.facebook.com/groups/64537698706/ There are lots of moms there who can tell you the same thing. The program is an answer to prayer. I have searched and searched and I cannot find one parent who was not ecstatic with the program there. How are you still using topical steroids, protopic, and wet wrapping? Through the winter our maintenance was a 20 min bath at bedtime, pat dry, apply a ridiculous and messy amount of moisturizer all over and wet wrap her hot spots (the hands and feet). The spring has been really hard on her, so now we are doing this in the morning too. I also gave in and put her on a daily antihistamine. When we have a bad flare we do the same thing but use a ridiculous amount of steroid ointment on the flare and wet wrap for 1-2 hours. This can be done up to 3x per day. Does this answer your question? Your story brought tears to my eyes mainly because I can fully empathise with you. Our little girl was diagnosed with eczema when she was 5 months old. We tried every natural product on the market…no luck! It was awful..she wouldn’t sleep..constantly waking scratching. She had allergy tests when she was 1 year old and we found her allergies to be wheat, soy,bananas,dairy,nuts,eggs,certain grasses and trees and dust mites. We cut these out off her diet immediately. Her skin never cleared up esp.around her mouth and eye areas. Her specialist told us she had acrodermatitis enteropathica due to a deficiency in zinc and vit d as she was deprived in these due to elimination of foods in her diet. All her orifices were constantly red weeping and infected. She was always on antibiotics and then she developed alopecia. Her hair, eyebrows and eyelashes fell out. It was devastating. Our little baby lost all her looks. I hated leaving the house because wherever I went we got stares..like my girl was an alien or something. Anyway we were determined to find a cure. We saw a new dermatologist who put her on regular antihistamines (loratidine) and prescribed more oilier creams. We had to bath her only with emulsifying ointment. We also had to use 1% hydrocortisone ointment mixed with emulsifying ointment everyday for 3-4 weeks until we got her under control..this was on her face..her body we used Dermol mixed with white soft paraffin also regularly for 3-4 weeks. Her skin cleared up in 3 days!! I kid u not! It was like a miracle treatment! Our girl is 3 years now and her skin is under control thankfully. We keep it always moisturised and dress her very cooly. In winter she only wears 2 layers..our winters get down to 5deg during the day. I freeze just looking at what she’s wearing but she doesn’t mind the cold. At night she never uses a heater in her room..just a thin sleeping bag and light duvet. As soon as she gets a runny nose I get on top of her treatment so that her flare ups aren’t so bad. And I avoid anywhere where it’s dusty and avoid going out on windy days due to excess pollen in the air. There is hope…don’t give up. You are an amazing mum! Thanks for sharing your story, Sacha! While we have our days, we are doing MUCH better. It often feels like we are the only one dealing with these things, but then you get online and find out you are not alone.